We spent about 3 hours in the ER, with some extremely nice doctors and nurses (Nora wants to invite them all to her next birthday party), and got 4 extremely painful X-rays. 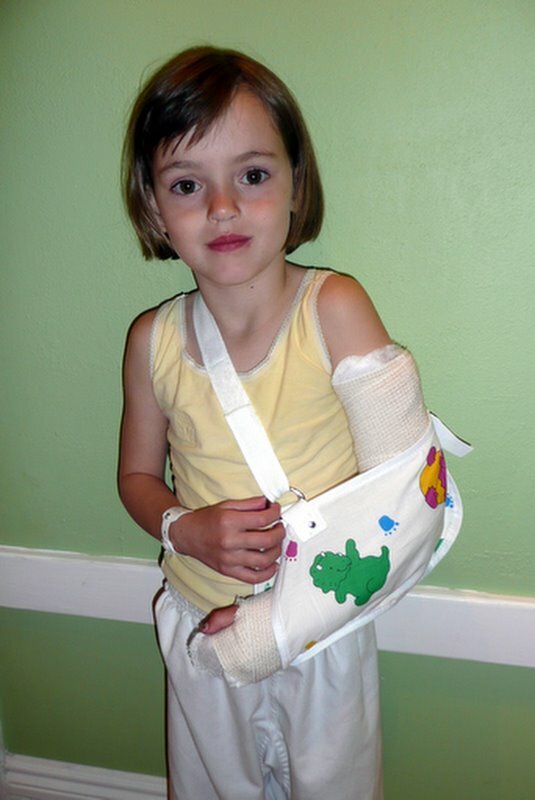 It turns out she has a “type two intracondylar fracture of the humerus” – in normal speak, she broke her left arm just above the elbow. Nora’s arm is in a temporary splint, and we have an appointment with the orthopedist first thing in the morning for a further evaluation, and possibly a more permanent cast. Nora is sleeping comfortably (thank goodness for tylenol w/ codeine. It was so funny… she seemed almost a bit “drunk” on it on the way home! ), and hopefully won’t have too much pain going forward. Here is her X-ray… I highlighted the 2 breaks with green dashed lines. 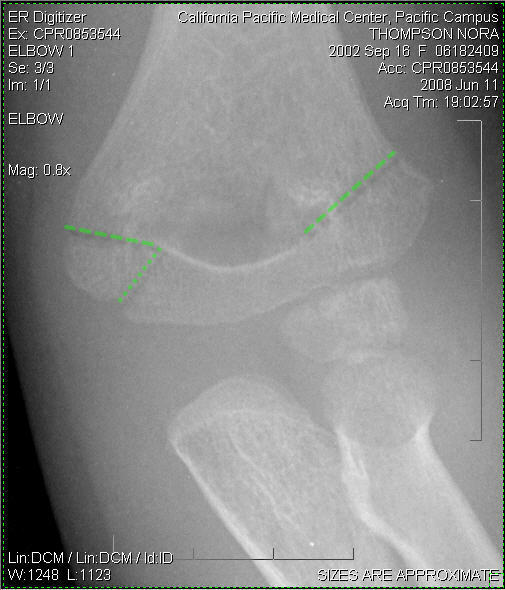 The green dotted line is a slight fracture, but isn’t as bad as the two dashed lines. Click the image to enlarge it. Nora passed her Orange Belt test at Enshin Karate last night! We are so proud of her for her hard work and focus. Sensei said “what’s the difference between a black belt and a white belt? A black belt is just a white belt who never gave up, always kept trying.” Great job Nora! View the rest of the photos on Flickr. “The name ENSHIN is derived from two Japanese words: en meaning ‘open or unfinished circle,’ and shin meaning ‘heart’ or ‘inner.’ The combination of these two words and their meanings embody the most important aspects of Enshin Karate. Above all else, the ‘inner circle’ of Enshin Karate represents the strong bonds that keep us together. The strength of this organization depends on the ability of each of us to listen to our hearts, and to relate to others through it. The circle is the essence of the strategy and movement in Enshin Karate. The infinite points on a circle represent the unlimited positions we move to and counter from in meeting an opponent. This circular movement that takes one out of a line of attack and into a position from which he can counter attack is the basis for Enshin Karate technique. The Enshin circle is an open circle. It is not complete, although it strives to be. It represents the idea that our challenge is never finished, although we are always working towards making it so. This unfinished state is a source of motivation and it reminds us that perfection is to aimed for even if it cannot be achieved. Nora’s best Christmas present was a card game called Sleeping Queens by Gamewright. She wakes up in the morning saying, “Can I please have some milk, and then we can play Sleeping Queens?” Truly. Every day starting on Boxing Day. And it is the first thing she asks to play when we get in the house after school/work. This company makes the most amazing games. Be sure to check them out if you haven’t seen them before. Nora has two other games that she loves, also by Gamewright: Wig Out (matching card game) and Feed the Kitty (a dice game). When we filled out our customer comment card after our second Gamewright purchase, they sent back a HANDWRITTEN postcard to Nora with some suggested games and personal responses to her note. Now that is stellar customer relationship management! Nora, Dell and Otto playing Trouble! Nora is green, Dell is blue, and Otto is yellow. Otto is a ruthless popper… he keeps knocking Dell and Nora back into their home bases. 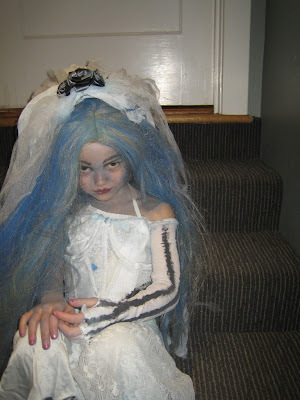 Happy Halloween from the Corpse Bride! Like mother (2005), like daughter (2007). Nora found my Corpse Bride costume in the “Boo Box” and wanted to wear it. So we stitched some elastic to hold it up around the neck. We fashioned a bone arm out of an old pair of tights and an undershirt. The remaining part of the tights went to the bone leg. The rest was straight from my version of the costume. A little blue skin makeup and some attitude… and there you have it! View a few more photos on Flickr. 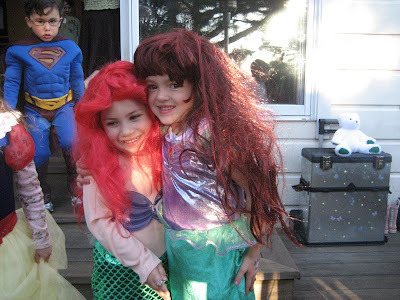 Nora’s mermaid party was a smashing success! View the photos on Flickr. 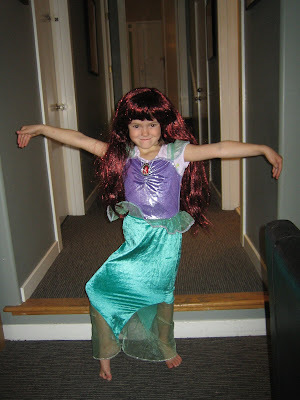 Nora Practicing for Her Mermaid Party! Nora’s JBBP had a huge “sports day” festival called Undokai, and I took the day off to attend and volunteer. The teachers said “if you are going to go to only one of your child’s Japanese celebrations this year, this is the one to go to… it truly is a spectacle.” I couldn’t agree more! Here is a video of Nora and Ketarie at Undokai doing the ball rolling race – it was great fun for the kindergarteners. The music was actually playing in the background over the loudspeaker, and it was strangely like a Japanese cartoon or a video game or something! View more photos on Flickr. UNDOKAI: This electrifying annual event is held in schools throughout Japan—elementary through high school. The Undokai event stems from Taiku no hi (Health and Sports Day), an official nationally recognized holiday in Japan that commemorates the 1964 Summer Olympics held in Tokyo. Undokai combines the Japanese word undo, meaning exercise, and kai, gathering. Throughout Japan, schools, cities, and other organizations promote unity, team work and friendship through the Undokai. In this same spirit, the Japanese school divides into teams and holds a series of competitions such as bean toss (bean bags into a basket high up on a bamboo pole), races and team relays, dancing displays, obstacle course, and the classic tug-of-war. Nora is trying out karate and seems to be liking it. She doesn’t have her white uniform yet (it’s called a Gi), so she is in her purple t-shirt in the video. I also get a huge crackup out of the boy to Nora’s right with the blond hair and yellow belt.